Former British spy Christopher Steele, the author of the controversial dossier alleging coordination between Trump campaign associates and Russian officials, has long sought to keep private details about his life. But a sprawling new profile of the former MI6 operative from The New Yorker provides new information on Steele’s research on President Donald Trump. From a bombshell claim about Moscow’s role in picking Trump’s Cabinet members to information on Steele’s life at home with his three cats, here are some of the intriguing new details about the mystery man. On Russia having an alleged say in Trump’s Cabinet picks: A memo Steele wrote in late November claimed that the Kremlin asked Trump not to nominate former Utah Gov. Mitt Romney for secretary of state, instead wanting him to nominate someone who was less hawkish on Russia. Trump officially dropped Romney from consideration for the position in December 2016, selecting former ExxonMobil executive Rex Tillerson. On US intelligence agencies knowing about Trump’s Russia contacts: In August 2016, according to The New Yorker, the head of a British intelligence agency briefed then-CIA director John Brennan on intercepted communications between Trump’s campaign and Moscow. Shortly afterward, the CIA received intelligence on Russian President Vladimir Putin’s personal involvement in Russian election interference. On Trump’s alleged connections to organised crime: While investigating international corruption at FIFA, Steele learned that FIFA official Chuck Blazer, who had embezzled a massive amount of money from the soccer organisation, had an expensive apartment in Trump Tower. He later discovered that a gambling and money laundering ring headed by a prominent Russian mobster was also run out of an apartment on Trump’s property, according to The New Yorker. After Interpol called for the man’s arrest, he was seen sitting near Trump at a Miss Universe pageant in Moscow in 2013, which Trump was responsible for running. “It was as if all criminal roads led to Trump Tower,” Steele told friends at the time. On Russia’s influence operations in Europe: A few months before starting research on Trump, Steele had worked on a wide-ranging intelligence gathering operation called Project Charlemagne. As part of the project, he detailed Russia’s social media influence and election interference campaigns in Europe that mirrored what Russia was doing in the US ahead of the 2016 election. Russia had attempted to bolster right-wing voices and France, Italy, the United Kingdom, Turkey, and Germany, and often gave politicians and right-wing leaders gifts and financial support. 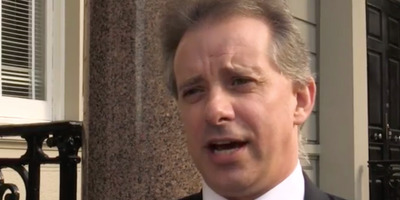 Some of the politicians mentioned in Steele’s research have denied his allegations. On Steele’s work on ISIS: Steele had long known about ISIS militants using the flow of refugees from Syria and other parts of the Middle East to enter Europe. Although he shared this intelligence with Germany, following the November 2015 Paris attacks, he said he regretted not sharing it with France as well. On Steele’s personal politics: Steele was a supporter of the center-left Labour Party and was part of a faction in his debate club at Cambridge University called the Anti-Establishment Faction. One of Steele’s friends at university summed up his political views:“He’s not an ideologue,” the friend said. “He’s got his political views, but he’s a pragmatic thinker. Fairness, integrity, and truth, for him, trump any ideology.” Later on, individuals close to Steele said he was disturbed by the UK’s decision to leave the EU in 2016. On how Steele began investigating Trump:Fusion GPS CEO Glenn Simpson was reportedly bothered by why Trump had repeatedly sought business deals in Russia but always came back with nothing to show for it. Steele was also interested in this question, and began doing research on Trump as a result. On Steele’s communications with the US government before 2016: In 2008 and 2009, Steele’s research on Russia was used to brief then-CIA director Michael Hayden and former President Barack Obama. Steele met with Hayden in person, and a report Steele authored on Russia was given to Obama, who was visiting the UK at the time. On the profits of his private intelligence company:The private intelligence firm Steele founded after leaving MI6 in 2009, Orbis Business Intelligence, reportedly made around $US20 million between its founding and 2018. On his relationship with the Russians: In 2012, an Orbis employee said a member of Russia’s Foreign Security Service (FSB) had called Steele “an enemy of Mother Russia,” according to the report. On his private life: Steele spends much of his free time with his family. He has three children, and also three cats. One of his cats recently wet one of his family’s beds – which, as The New Yorker noted, mirrored an infamous claim from the Trump-Russia dossier.